Allagash Gateway Campground & Cabins!!! 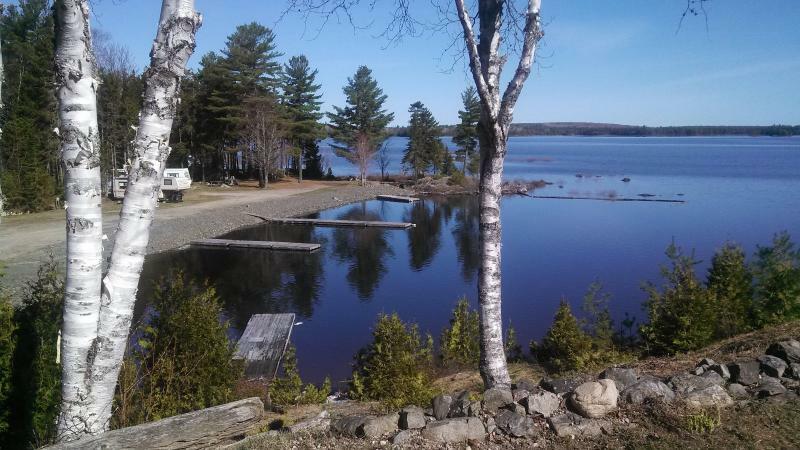 Allagash Gateway Campground & Cabins is located on beautiful Ripogenus Lake, right next door to Chesuncook Lake, the third largest lake in Maine at 23,070 acres. We offer cabins and premium as well as primitive campsites, RV sites, showers, boat launch, docking in the protected marina, as well as canoe/kayak rentals and transportation services to the Upper West Branch of the Penobscot River Corridor. Fish for land-locked salmon, trout, togue, perch, smelt & cusk. Hunt or see all creatures native to this area of Maine. Closed for the month of December & April:some exceptions may apply, please call for details. Any deviation from "family" is $10*/person/night in the primitive area & power water sites include 2 adults, additional adults are $10*/person/night. Pets are welcome here & must be on a leash, please clean up after your pets. There is a one time fee of $10/pet when camping. All seasonal campers will have to pay campsite rates during non seasonal dates and call in advance from the end of Nov. until March the following year. We have 4 small cabins that house up to 6 people and 1 large cabin that can house up to 12 people. Children under age 5 yrs are free. A deposit of $200 is required at time of booking which is nonrefundable if you cancel (effective within 24 hours of booking). Cabins are propane in nature and include a heater, 4 burner cook top, refridgerator and lights. The cabins have all cookware and linens provided. Privys are close by and showers are available from 5-730 pm for $4.00/person at the main lodge. We now offer winter showers. Water is portaged to you daily for dishes and such from our well. Sorry, no refunds on deposits or stay. There is a 2.9% charge for using any debit/credit card. 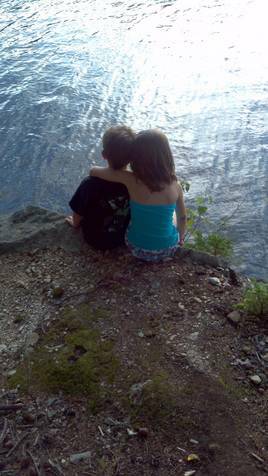 On the ledge in Suncook Cabin, beautiful view of the lake. Fishing in the local area is exceptional. Right off our main dock is some of the best salmon and trout fishing the area has to offer in any season. In the winter months we also offer ice fishing, snow shoeing, cross-country trails and the snowmobile trails that are accessable from here. We will be expanding these trails to connect with other area trails soon. Hiking Mount Katahdin is also a favorite for most, it is approximately 29 miles to the base and you should allow about 1 hour for driving when leaving here. The North Maine Woods is noted for its big bucks! We are located in the heart of buck country. Hundreds of miles of maintained roads in our area make it a hunters paradise for deer, bear, grouse, rabbit, moose, coyotes & bird watching. Allagash Gateway Campground & Cabins offers it all. Keep your eye out for changes regarding bear baiting and guiding.There are also an incredible number of moose in our area -- if you are lucky enough to be selected in the annual moose lottery. Moose Season is by Permit Only! 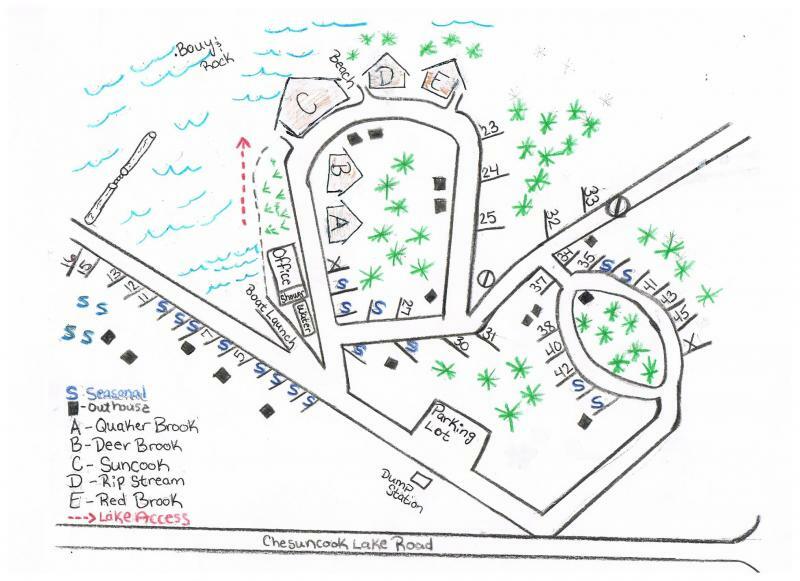 Facilities include a boat launching area, docking for boats, parking for cars and trailers. Shuttles all over... especially to multiple points along the Penobscot River Corridor. Campsites are in harmony with nature, some being secluded and others more open. Each campsite is provided with fire ring & trash container. Drinking water is supplied by an on site well. Canoes & kayaks are available for hourly and daily rental. A security deposit is required for rentals in the form of cash or credit card & you are required to sign a waiver. There are limited supplies available at the Main Lodge. We also have a library of books,games & cards to borrow.